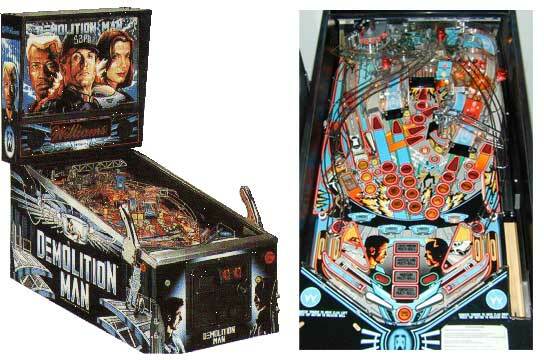 Check out these Demolition Man Pinball Machines For Sale by Williams. You will also find parts and accessories including the Flipper Handle Gun Button Assembly, Ramps, Flyer, Sound Board, Flipper Rebuild Kit, Fuse Kit, CPU Rom Chip Set, Translite, Playfield Plastics, Target Set, Mods, Keychains, and Custom Target Decals. Serious and demanding game play. The best part about this game is nailing ramp after ramp, especially during a long multiball session. For a wide-body, Demolition Man moves pretty fast, only slowing down when the ball is shot into the claw at the top left of the playfield. The Pinball that will Blow You Away! It's sure to arrive with a Bang!